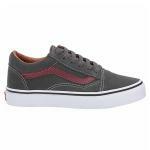 Youth Skate Branded Footwear: Trainers, Shoes, Sneakers. Start them young! Whether you're little one is ready to roll or you're just looking to kit them out in some cool skate sneakers then we've got it covered. Etnies, Vans and Nike SB do a great range of kids skateboarding shoes in toddler and youth sizes.